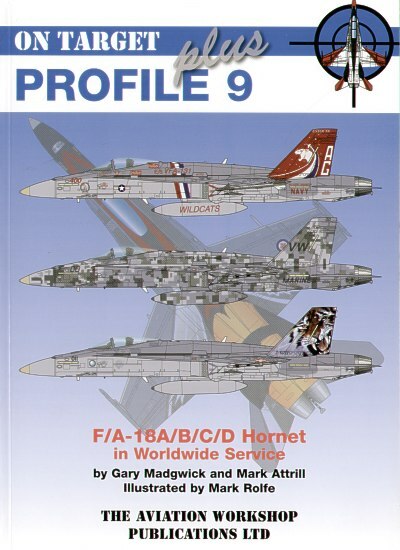 Advantages: Packed with attractive profiles; many and varied colours and markings across all Hornet operators; logically organised; includes scrap views, operational and walkaround photos; detailed and useful captions describing ops, colours, markings and unusual features; specific references cited; great source of inspiration for modellers. The Aviation Workshop has released their biggest yet "On Target Profile" book. The subject is the F/A-18A/B/C/D Hornet in Worldwide Service. The book comprises 112 pages in full colour. The structure of the book is the familiar style of earlier "On Target" titles - some descriptive text at the beginning of each Chapter followed by a wealth of colour profiles and detailed useful captions. This title also includes many reference photos of operational Hornets in US and worldwide service, once again organised logically at the end of each Chapter. This is especially useful to modellers, as the artwork will provide the inspiration; but a photo will identify a myriad of minutiae. Captions accompanying the profiles and photos are excellent, describing colours, markings and operations. More than half the book is devoted to the Hornet in the service of "foreign" forces - CAF, RAAF, Finland, Spain, Switzerland, Kuwait, Malaysia and more. The coverage of Canadian and Australian Hornets is especially impressive. The Authors are to be commended for rooting out some of the most varied and colourful schemes seen on these first generation F/A-18 Hornet over its 28 year history, including many CAG birds, Aggressor schemes, Digital camouflage, a Ferris scheme and some of the wild commemorative colours applied by Canada and Australia in the last decade. All schemes are well depicted in colour profiles by artist Mark Rolfe. The aircraft are often shown with ordnance in place, and there is a generous allowance of four-view (both sides plus top and bottom) colour illustrations supplementing the profiles every few pages. If you have the slightest interest in the colours and markings of the F/A-18A/B/C/D Hornet, or if you are seeking inspiration for your next modelling project, you need look no further than Aviation Workshop's On Target Profile 9.